Are you a gambler? Seriously, do you take your chances on everything or are you a careful planner? Do you throw caution to the wind with solid faith that everything will work out in the wind or do you try to control every aspect of the environment around you. I’ve noticed that in this world there are those that seem born to gamble, to take chances and take risks and those that agonize over he slightest and smallest of decisions often second guessing themselves into oblivion and back again before ultimately deciding to do that which they truly wish to do. There are people who are far too capricious with lady luck and those who harbor no illusions about her fickle nature. Whichever type of person you are, there is a game for you to play in Vegas. Yes, even those who don’t gamble and aren’t willing to risk a single penny can find something fun and fabulous to do and enjoy during their stay in this great city. Vegas is beginning to transform itself from “Sin City” to a more respectable place to have and bring children. There will always be the shows that this city is so famous for but they are often tempered with afternoon magic shows, clowns, and music reviews that honor performers from innocent (and not so innocent) days gone by. 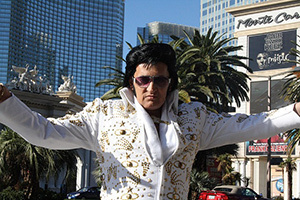 Where else on earth could you see Elvis Presley walking next to Marilyn Monroe and Diana Ross? Where else on earth can you see a clown walking around almost (if not) 24 hours out of each and every day? There are so many strange and wonderful things to see and do in this city that even if you’ve never set foot inside a casino and still have no intentions of doing so, there are still many, many things you can find to keep you entertained and happy. If you’re not sure what you’d like to do in Vegas, my first suggestion is that you find a spa that will let you hide out from the world for your entire first day. Allow yourself to be pampered and primped and treated completely and utterly like the prince or princess you are deep down inside. Once you’ve begun to really relax and are ready to think about the many options that abound. Consider your budget and choose your activities according to your spending abilities. There are actually enough free activities in Vegas to keep you busy for at least 3 days if not 4 or more (depending on your interests and how many of the paid adventures you’d like to participate in).